Many of us have animals that live with us and for the most part, we could never imagine having it any other way. If you are somebody that has a dog in your home, you likely enjoy their faithfulness as well as the absolute love that they provide without any hesitation. There may be some frustrations that go along with dog ownership, but we tend to overlook them. One of the things that you are eventually going to have to consider when you own a dog is if they are going to sleep in bed with you. This can be quite a difficult decision to make, because you are actually giving up part of your territory that you may use on a nightly basis. Let’s face it, anybody who has ever slept with a dog realizes that they don’t give you the extra room. They have no problem hogging the bed, and it can be frustrating. 1. Comfort – it might be the fact that we are not alone or it might be their steady breathing but it certainly does present a comfortable environment when you have a dog in the bed. 2. Insomnia – For those who struggle with insomnia, it can be quite a relief to have a dog by your side. Dogs offer a sense of security and that can help you to get a good night sleep. 3. Stress – when you struggle with stress, you can snuggle with your dog and it seems to take all the stress away. 4. Warmth – when a dog curls up next to you at night, it is like having your own, personal heater. This may be a problem in the summer but in the winter, there is nothing quite like it. 5. Depression – The unconditional love that is provided by a faithful dog is excellent for those who battle with depression. When you have your dog with you at night, the difficult times seem a little easier to manage. 6. Safety – most dogs are quite aware of their surroundings, even during the night. When you have a dog watching over you while you sleep, you don’t tend to worry about what is going on. 7. 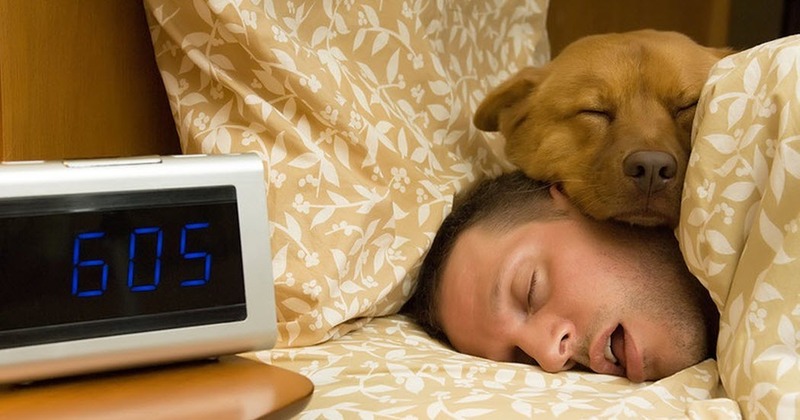 Good for the dog – it is good for humans to have a dog sleep with them, as any dog owner will tell you. It is also good for the dog, as it gives them comfort and they love being by your side.